In 1887, in Oregon’s remote Hells Canyon, an improbable gang of horsethieves and schoolboys robbed and murdered as many as 34 Chinese gold miners in the worst of the many crimes committed by whites against Chinese immigrants in the American West in the 19th century. The crime was discovered when the battered bodies of the Chinese began appearing in the Snake River at Lewiston, Idaho, 65 miles to the north. The gang had thrown the bodies into the river. Even though the killers were known, and one confessed, no one was ever convicted of the crime. A grand jury indicted six men and boys, one as young as 15, for murder, but three of the men escaped, including the ring leaders. After a brief trial, three others were found innocent by an all-white male jury, which had little sympathy for the Chinese. A cover-up followed and the crime was all but forgotten for the next 100 years, until a county clerk found hidden records in an unused safe. 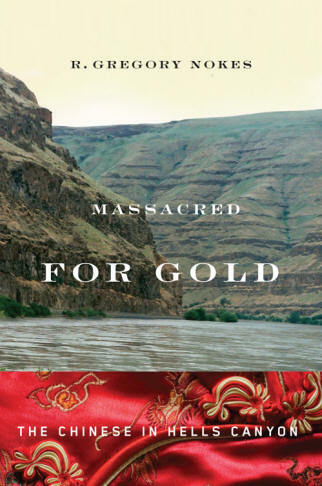 Massacred for Gold: The Chinese in Hells Canyon traces the author’s long, personal journey to expose details of the massacre and its aftermath to understand how the crime was kept in the dark for so long. As he pursued the story, he was haunted by one overriding question: Why did the gang kill the Chinese when they could easily have taken their gold and let them go? There was little chance any lawman would want to enter the canyon — the deepest in North America — to investigate. Few at that time cared about the Chinese, who were the target of discrimination throughout the West. The author’s conclusion as to why the Chinese were killed is chilling: The crime was a savage act of racial hatred. In his book, the author also tells of the experiences of the tens of thousands of Chinese who journeyed across the Pacific to mine gold and build railroads throughout the American West. At first they were recruited to alleviate a shortage of labor, then reviled when jobs became scarce. Hostility toward the Chinese resulted in Congress enacting the Chinese Exclusion Act in 1882, which barred any more Chinese laborers, although allowing those already in the country to remain. After the book came out in 2009, the author and a group of volunteers organized the Chinese Remembering Committee to keep alive the knowledge of the long-forgotten crime. The committee raised money for a memorial to the murdered miners at the site of the massacre, high on a cliff overlooking the Snake River. 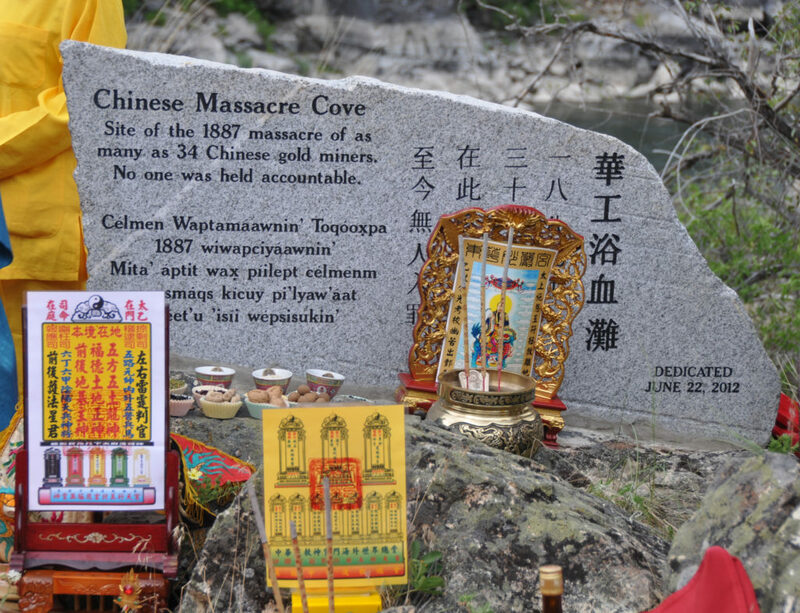 The federal government has officially designated the site as Chinese Massacre Cove. 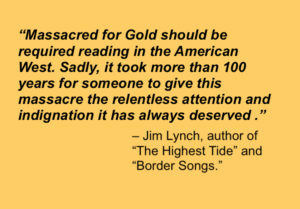 Now in its fourth printing, Massacred for Gold was the subject of a 2017 Oregon Public Broadcasting television program. Published in 2009 by Oregon State University Press.